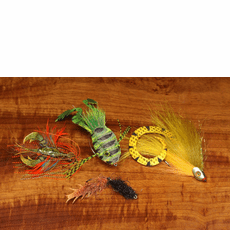 The Caddis Fly Shop carries traditional and modern synthetic materials for fly tying, including supplies for trout, steelhead, salmon, bass, and saltwater flies. Synthetic fly tying materials may be a product of the modern world, but these materials are rapidly joining the ranks of our most favored, most fundamental fly tying must-haves, available in upwards of fifty colors and textures suitable for the smallest chironomid or midge wing to the largest saltwater streamer fly. 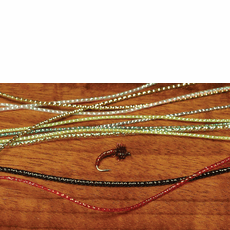 Whether you tie flies for trout, pan fish, bass, bonefish, tarpon, carp, salmon, or steelhead, chances are good that you reach for a synthetic fly tying material conceived, developed, produced, packaged, and distributed to your retail source, (i.e., The Caddis Fly Angling Shop) complements of Hareline Dubbin in Eugene Oregon, USA. Each synthetic material Hareline produces has an intriguing history, starting with from the moment someone imagined using it on a fly hook,. 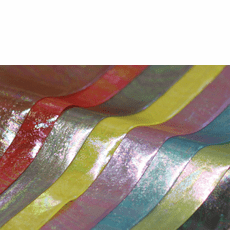 The material�s heritage includes consultations with manufacturers; evaluating its dye, color, and reflective qualities; tying flies with evolving product samples; fishing flies constructed with the new material, developing an attractive and cost-effective packaging, conceiving a snappy name for the product, and finally, giving the new material sufficient time to be tested at fly bench on water by pro and amateur tyers around the world. The very first stage on the potential production line is a question regarding potentialneed. Is there a genuine need for anything new in the fly tying materials department? 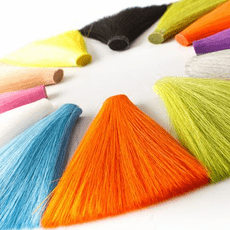 Turns out that there is great need for synthetic fly tying materials these days, and the need is only likely to increase over time. This is true because the supply of natural and domesticated birds and animals we formerly obtained our fly tying materials from is declining, while the demand for quality fly tying materials is growing. Here are but a few examples of how synthetic fly tying materials have come into play in three basic elements of most flies: body dubbing, hackles, and wing materials. Synthetic Dubbing Materials. Thirty years ago, many flies tied for trout, salmon and steelhead relied on Seal fur to create spikey, translucent dubbed bodies. 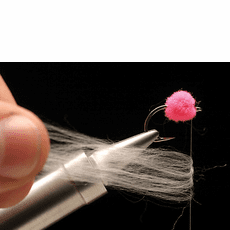 For a variety of reasons, Seal fur is not available, and the quest for a good dubbing material has consumed fly tyers ever since the supply of traditional dubbing declined. Today, thanks to Hareline, many superior synthetic dubbing blends have replaced the traditional material. Hareline Ice Dub, STS Trilobal Dub, Senyo�s Lazer Dub, and Bob Borden�s Custom Blend are examples of synthetics, or synthetic blends that we are likely to use every day at the fly bench. 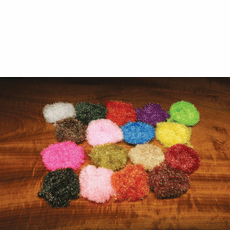 Taking materials innovation to the edges of possibility, Hareline has also pioneered incorporation of these synthetic fibers into modern chenille and dubbing brushes. Synthetic Hackles. 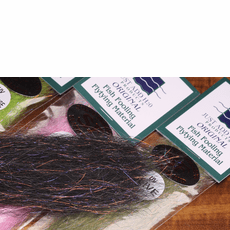 Synthetics fly tying materials have made a big splash (please pardon the pun) in this fly tying materials category, although for the moment it is principally in the wet fly rather than dry fly world. 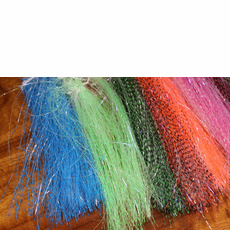 Materials like the Hareline Pseudo Hackle, Krystal Hackle, UV Polar Chenille, Pseudo Marabou, are examples of synthetic hackle materials that are available in sizes for large and small flies, in a wide range of colors, and have the various desirable qualities like being shimmery, and wiggly; and have thus earned a reputation as dependable hackle substitutes on sunken flies that formerly relied entirely on natural feathers. Synthetic Wing Materials. Synthetic wing material is another area of synthetics where Hareline has taken an industry lead. 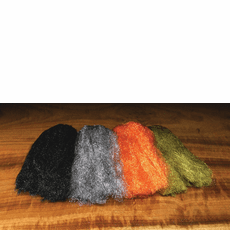 Hareline Pseudohair is a superbly useful wing material that was brought to our fly benches through months of collaboration with fiber manufacturers, dozens of sample runs, and hundreds of sample flies tied and fished to ensure the product met the desired characteristics. PesudoHair has a short, fine underfur and intermixed 3.5� guard hair. Many fly tyers have found Hareline Pseudohair an excellent substitute for Arctic Fox Tail hair, incorporating it into salmon, and steelhead flies, fresh and saltwater streamers and baitfish patterns. 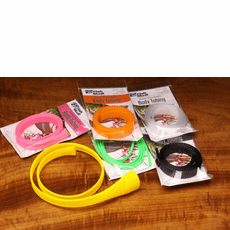 Hareline�s Baitfish Emulator Flash is another example of an innovative synthetic wing material, all regulars in the streamer and baitfish fly tying circle. Wings on dry flies? Oooops, almost forgot to mention these. Synthetic materials like Para Post Wing have replaced Calf tail and calf hair on our parachute flies, and the synthetic material is wonderful to work with. Mayflies and stone flies, dragon flies, too, are easier to tie and a delight to behold thanks to Web Wing, No-Fray Wing, Thin Wing, and yes, Thick Wing synthetics that we cut either with scissors or with dandy wing cutter tools. Expect the explosion of innovative synthetic fly tying materials to continue in the next five years like it has in the past five years. 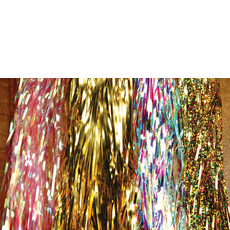 Is there a limit to what one can achieve with synthetics? Too soon to say. Are synthetic dry fly hackles in our future, or just more exciting dubbings and winging materials for wet flies? Again, it is simply too early to say. Stay tuned, keep your ear to the ground, and let�s see what the creative folks at Hareline develop; there is sure to be some fly tying fun at hand.